I live in an area that’s surprisingly void of local craft brew. Yes I can drive north or south a few hundred miles and be knee deep in world class breweries, but there’s something about having a little place down the street. Two days before their “soft” opening I got some information on Inland Empire Brewing’s public debut and I’d be a poor “beer guy” or if I didn’t stop into a hometown opening and drop off some magazines. Driving up to the little business park was like finding an Easter Egg in a hayfield but by the crowd of people outside with beer shirts on it wasn’t too hard. 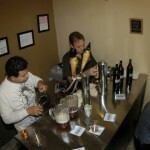 The 3 owners where located inside pouring their first brews, form what they said was their first batch. That might be a little risky to some because there is a learning process that comes with new equipment, but people were happy and beer was flowing. Their equipment is unique with a heating element in the kettle, which added some sweetness to their beer. They had 3 different styles to sample at the time and each was a little sweet, and not too bad for their first big batch. 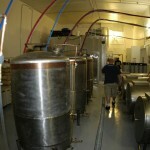 We’ll be keeping an eye on this little microbrewery and stopping by frequently to follow their progress.